In today’s world organizations utilize information technology (IT) to enhance business capabilities. Designing, developing and operating technology systems and services has transformed into designing, developing and operating technology enabled business capabilities. Systems engineering (SE) is a field of expertise virtually needed by all businesses, used to integrate business capabilities with technology capabilities, commonly utilizing enterprise architecture (EA) practices and methods as it’s medium. There is very little margin for error in today’s world. The bigger and more complex the IT enabled business projects become, the more errors multiply, and the greater the need to employ a combination of systems engineering management and EA practices. Not just to meet cost, schedule and performance commitments, but also to provide quality, value and satisfaction in successful projects. Activities need to be fast, precise and adaptable, driving the need for a systematic way to analyze, plan, manage and control the activities of the enterprise as a whole, in order to eliminate waste and defects, and decrease schedule time. Business transformation projects require proper SE-based and technology-based project management practices and can no longer rely on business-based and IT-based practices alone. Business operations as well are becoming increasingly technical, social and cultural, complex and in need of being agile and adaptable. In an operating environment with a rapidly and constantly changing mixture of interconnected people, process, information and technology, in the business and in the marketplace, business transformation projects now routinely span all business operations. These projects require a holistic and integrated approach, well beyond the span and depth of traditional business architecture and IT architecture practices. 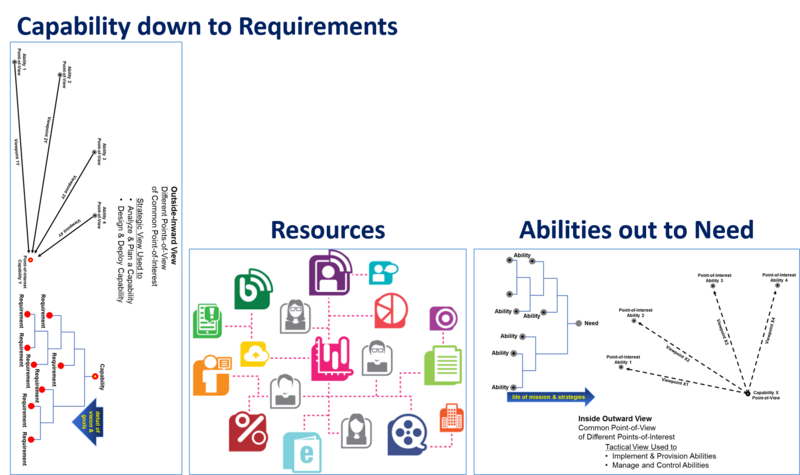 Many EA practices are primarily capability-based views emanating from inside the enterprise and looking outward to determine the abilities needed to provide customers with desired capabilities needed. This view is ‘capability-centric’ supporting ‘doing’ from the bottom up but does not fully support ‘thinking’ from the top down. Designing, developing and operating technology-based business systems and services without understanding the needs of the business, customers, users, workers, managers and all other stakeholders results in ineffective efforts and creates waste. Conversely, ‘need-centric’ views of the enterprise enable and facilitate this understanding. We are in the cusp of entering the next generation of enterprise architecture practice where representation of the enterprise as-a-whole from the top-down is a necessity for successful EA efforts. Furthermore, there are new physical viewpoints needed to support this holistic perspective. Holistic enterprise practices require external views of the enterprise on which to define and construct capabilities as well as internal views to identify abilities needed. Integration of these views, enables a balanced and aligned view to address socio-technical abilities, adaptive human behavior and socio-cultural forces. The combination of rapidly changing technology needs and socio-cultural forces on the socio-technical enterprise are driving a need for a philosophical view of an enterprise in the market environment, where analysis, planning and definition of needed capabilities is aligned to and balanced with abilities provided by the enterprise to satisfy the need. Looking at an enterprise as a system reveals a totally holistic and fully integrated view of an enterprise, its people, processes, information and technologies. As a system, the enterprise can be seen as it operates in the market environment to successfully deliver on its mission and satisfy its customers and stakeholders. 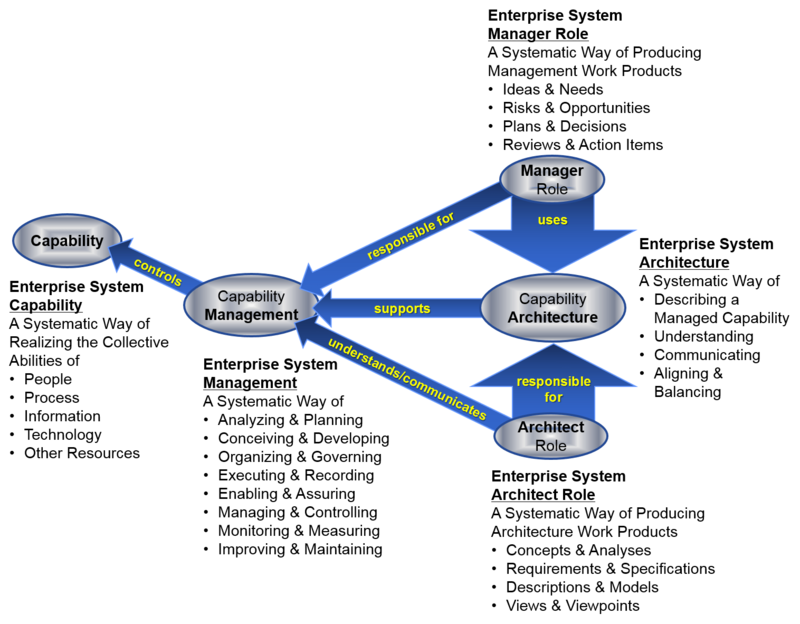 As shown in the video, with the mission and goals of the enterprise system driving the focus of interest within, the basic and fundamental needs of the enterprise drive the basic and fundamental capabilities to differentiate into broad and distinct, high-level categories, based on what the capabilities are intended to do (their functionality) and the purpose they serve (their goal). This enables and assures identifying the activities (‘the workings’) and work products (‘the results’) associated with the basic and fundamental capabilities the enterprise needs and the ultimate results the enterprise expects. This process-oriented mission-centric view of an enterprise supports governance of the enterprise, enabling and enhancing operations, management and control. 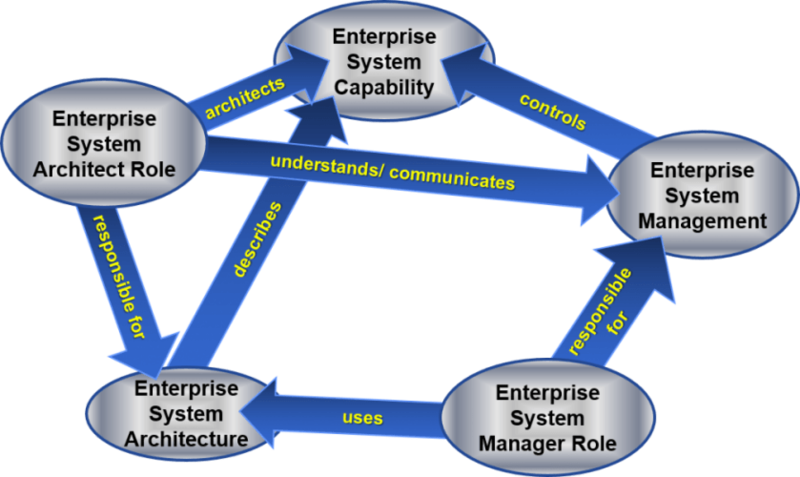 Within the enterprise system are systems for realizing, managing and architecting capabilities. Each system is a collection of resources doing different but related things which must within their system behave and produce as a whole for their system, and outside their system behave and produce as a whole for the enterprise system. The competition for common resources between capabilities serving their mission and the common mission of all capabilities, drives the need for a systematic way of functioning across all capabilities in order to keep all capabilities balanced, aligned and working properly in the best interests of the whole. capabilities being realized by people and technology, executing processes, and using and producing information, technology and other resources. Capabilities are aspirational, structured things to be expected, things which are needed and can be planned. Capabilities are requirements, a specification of what is desired. Abilities are actionable, functioning knowledge and experience-based proficiencies and competencies involving people, tools and equipment. Abilities are things which people and technology can do repetitively, have experience performing, and which are, in the context of an enterprise, desired by an organization or otherwise needed to realize a capability. There can be and often is a difference between capabilities needed as required and abilities available or working. For this reason actual behaviors need to be constantly and routinely compared with expected behaviors. Then decisions must be made by management, to ensure that people, working activities, work products, information, technologies and other resources, considered for inclusion in a capability description, meet both the needs and constraints of the customer, program and enterprise. Furthermore, socialization and culture are influences, stimulatory things. Things which affect the outcome of planned expectation. Things which play an influential part in the difference between the planned capabilities needed and the actual abilities provided. Socio-cultural forces are becoming more influential as socio-technical abilities increase, quickly making actual enterprise system behavior different than the expected behavior. For the system to be able to react quickly to the difference, the total system must be informative and the control system response and total system reaction needs to be immediate approaching instantaneous. Resources are often shared between capabilities. This causes resource capacity and availability issues during the periods in time when the capabilities are realized, and the resources needed must be ready, applied, committed and sufficient to meet the need. All of this drives the need to align and balance all capabilities with their related abilities. To accomplish this the relationships between the requirements, capabilities, resources, abilities, and needs must be established (aligned) and abilities and/or requirements continuously adjusted until the abilities can meet the requirements and satisfy the need for the capabilities (balanced). In this way all capabilities work properly in the best interests of the whole. An enterprise architecture team as with all product, service and need-driven teams, is composed of people with varying functionalities, all working towards serving a common need. Each person has a set of specific skills, abilities, knowledge and experience related to a ‘discipline’, and understands the specifics of the specific functionality which satisfies the need. Each discipline is assigned to roles with tasks, goals and objectives requiring their skill set. 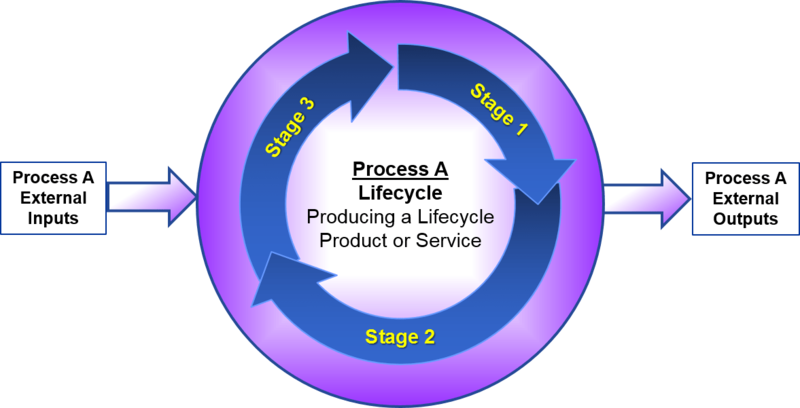 Each skill-set has a lifecycle process (a ‘track of tasks through time’) producing the functionality needed to produce a lifecycle product or service over the lifetime of the efforts to satisfy the ultimate need for the product or service. Each lifecycle process begins with initial external inputs and ends with final external outputs. Each process has stages where the outputs of the previous stage become the inputs to the next stage (i.e., internal inputs and outputs). The length and number of cycles, spans and stages is a function of the product or service produced and the stages, spans and cycling vary accordingly. 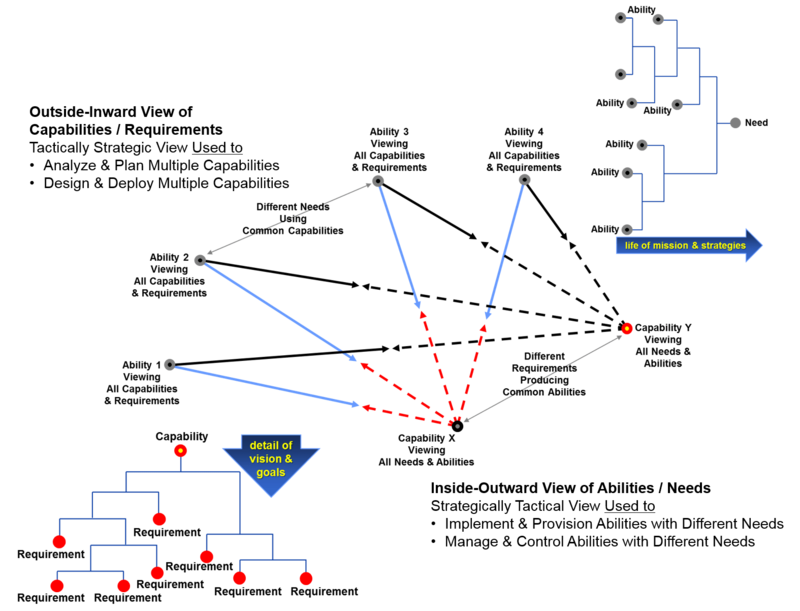 This functional variation causes the execution of multiple lifecycle processes to be complex and difficult to manage and control. 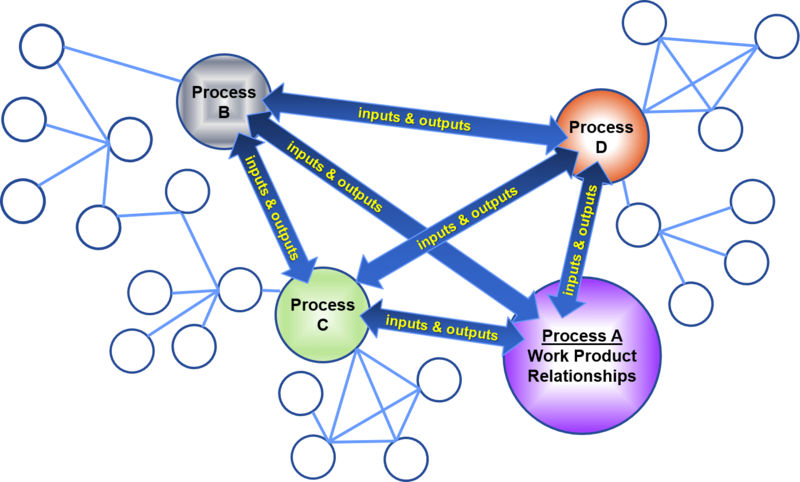 There are ‘working’ interdependencies (‘needs’ for work product inputs and outputs and related information) between the ‘network’ of team members (skill-sets). It is these work product and information needs which form time-dependent relationships in the flow of this cross-functional work. The complexity of managing and controlling the working interdependencies between the team members becomes evident in the flow of work during cross-functional team efforts. There are multiple lifecycle processes, each with a series of lifecycle stages, where each stage has network processes spanning between the stages of the multiple lifecycle processes of different stages, spans and cycles. Holistic enterprise architecture in its entirety, is not the job of a person. It is the job of a team and each team member has a distinct function (a role) defining what they do. Without the knowledge of how everyone fits in, and an understanding of expectations and cooperation between team members, the team will not succeed, regardless of the talent of the individuals. The enterprise as a system perspective defines managerial and architectural roles in terms of the functionality they serve so team members can understand what they do regardless of what they are organizationally called, which varies from company-to-company, organization-to-organization and job-to-job. 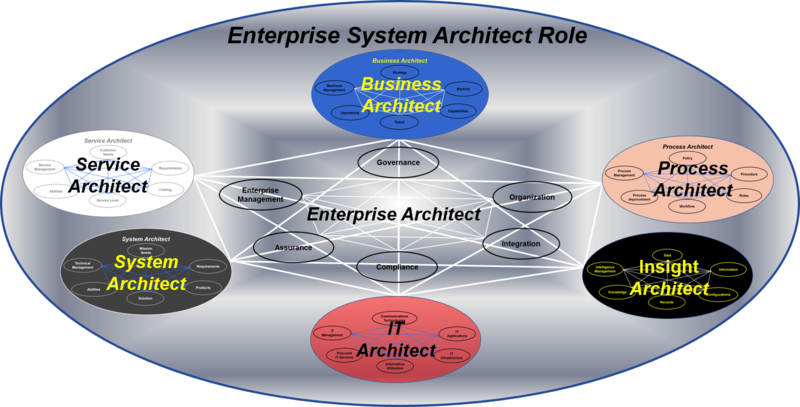 The enterprise system architect role is a conceptual view of a systematic ability to realize the role responsible for architecting the enterprise system architecture in support of the enterprise system manager role. In practice the enterprise system architect role is multiple roles serving different purposes for a common mission, driving the need to effectively and systematically function as one cohesive architectural role. Each team member has interdependencies with other team members and what the others do. 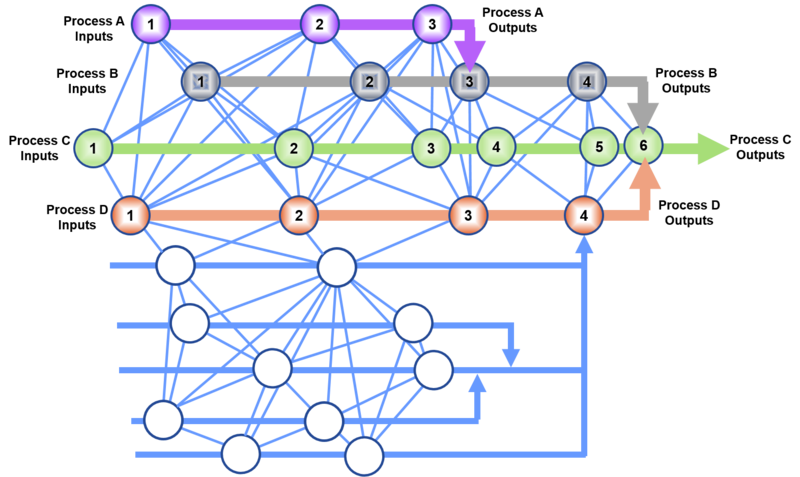 Looking at each team-as-a-system in a system-of-systems perspective is key to understanding, communicating and addressing the interdependencies between the teams. Each team boundary creates a degree of barrier/functional silo (i.e., degree of separation), impacting the effectiveness and efficiencies of the interconnections and interdependencies between team elements of different teams. In other words, the lower order a team function is, the more disconnects and independencies it has with other teams, and the less it serves the higher order needs of the other teams. This differentiation in functionality drives the need for the teams to be addressed as-a-whole and properly integrated in order to work as expected. With the knowledge of how everyone fits in, and the setting of expectations for the team, it can then organize, synchronize and function to best utilize the talent of the individual team members, maximize workflow, and maintain control with minimal management in ‘out-of-flow’ conditions when adaptability and variance is needed. There are working interdependencies for work products and related information between team members. Work product and information needs form time-dependent relationships in the flow of cross-functional work. The lower order a team function is, the more disconnects and independencies it has with other teams, and the less it serves the higher order needs of the other teams. All teams serving the common mission of the enterprise demands cross-functional dependencies be identified, understood, aligned, balanced, managed, controlled and communicated. Needs for agility and affordability demands cross-functional activities be coordinated, cooperative and synchronized further increasing needs for cross-functional communication, understanding and integration. 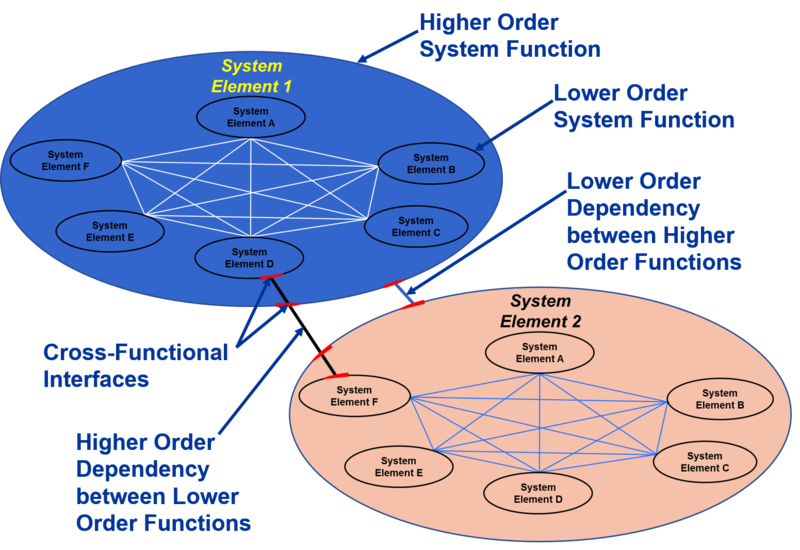 Lower order cross-functional dependencies must be addressed to enable and assure the functionality of all dependent higher order capabilities. Managing and controlling cross-functional dependencies between teams is therefore critical to managing and controlling integrated activities, and in enabling and assuring proper and thorough consideration of changes to capabilities and the resultant impacts and needs on resources and other capabilities. All teams serving the common mission of the enterprise demands cross-functional activities be aligned, balanced, managed and controlled. Identifying, understanding, addressing and communicating cross-functional dependencies between teams is critical to managing and controlling integrated activities, and in enabling and assuring proper and thorough consideration of changes to capabilities/offerings, and the resultant impacts and needs on resources and other capabilities/offerings. For example, with high-dependency interfaces between lower-order cross-functional capabilities, changes to the process-related workflow must be managed and controlled to holistically consider the corresponding impacts to offering system and service solutions. Changes to workflow and solutions may or may not impact the business operations supporting the offering and provisioning of the systems and services. Changes in workflow, solutions and operations could also impact data, information, configurations, records and knowledge. In turn, changes to all these elements may impact information utilization within the IT network, the integration of capabilities and resources, and compliance with enterprise requirements. Conducting business and executing cross-functional processes uses and produces information to provide insight into the state, conditions and workings of the business. Insight is produced and used as cross-functional input to operational activities and ultimately serves to support executive, management and leadership decision making. Not all information is within the management information system, its usefulness and application is also within worker’s and operational activities. Furthermore, to analyze and plan capabilities, and to manage and control abilities, requires informative sight into the past and present workings of the enterprise and the resultant abilities and satisfaction of needs. ‘Insight’ is an ability under constant demand. As the quantity of people, process, information, technology and other resources increase, the need to capture, comprehend, recall and apply what is both becoming known and what is already known increases, driving the need to realize an ability to learn, understand, communicate and apply what is explicitly known. Insight-based information management enables and assures data, information, configurations, records and knowledge support, knowledge management, enterprise information management, big data, business intelligence and artificial intelligence abilities beyond the intentions, goals and abilities of traditional information management. Next generation EA is holistically practiced over the whole enterprise and throughout the full transformation lifecycle. Activities extend past architectural design into the cross-functional reality of architectural change during detailed design and implementation, through the architectural adjustments needed to get through integration, verification and deployment, out to the architectural transformations needed to sustain operations and beyond. Management analysis and planning with costs, schedules, risks and opportunities is only the beginning of a transformation journey. Any architectural design which is difficult to realize is not a good design. An enterprise has to be designed for realization where the reality of the ability to realize it must be addressed. Just as “throw it over the wall” engineering was ended through integrated team work, “throw it over the wall” enterprise architecture must end. The next generation EA team is an organized and integrated team with the ability to understand and communicate how everyone and everything fits into the “big picture”. For information on the eBook please see eaBooks.net.